Manila, Philippines – President Rodrigo Duterte has once again hit the Catholic Church, saying that it a “creeping influence of faith’ despite his administration’s effort to control the country’s fast-growing population. 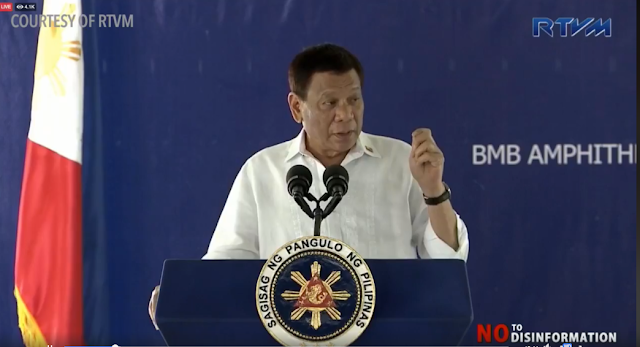 In his speech during the 31st founding anniversary of the Department of Environment and Natural Resources (DENR), the president expressed doubt on the Church’s opposition to artificial family planning. “Kung bakit naputol [Why was it stopped]? It’s because of the influence dito sa taas. And that is one of my reasons why I do not like itong [this], the creeping influence of faith is that they sometimes run counter to what government believes to be good for the people, at least in this temporal life,” President Duterte said. “We’re getting so many in number. Wala talaga tayong magawa [We can’t do something about it]. We have breached the 100 million mark. It’s now 105 or 10 depending on your statistics. Eh saan ito pupunta [Where will all of these go]?” the President added. Duterte said he did not want to pick a fight again with the Church, but stressed out that implementing the family planning method will help in sustaining the economic growth. He said that implementing it in the country has really something to do with the objection of religion. Obviously, the influential Catholic Church had played a big role in stopping the execution of the Reproductive Health Law, with the country’s highest Catholic official criticizing the government’s measures to reduce or at least control the population. Even during his stint as mayor of Davao City, the president made reproductive health his priority, he funded birth control programs such as ligation and vasectomy. The current administration aims to slash the poverty rate to 14 percent by 2022 from 21.6 percent in 2015 through its 10-point socio economic agenda, which includes “strengthening the implementation of the Responsible Parenthood and Reproductive Health Law”. This agenda of the government will enable the couples especially the poor ones to make informed choices on financial and family planning. Opponents of the Reproductive Health law, majorly, the Catholic Bishops Conference of the Philippines (CBCP) claimed that use of contraceptives is tantamount to using abortifacients. In 2015, Cardinal Luis Antonio Tagle was interviewed by BBC host Stephen Sackur, he was asked on what is the CBCP’s stand on the reproductive health law. Recently, the tension between the president and the Catholic Church has grown after Duterte’s “stupid god’ remarks and tirades against some its teachings, which irked the Catholic officials. Though the president refused to apologize over his remarks, he, on the other hand, formed a four-membered panel tasked to hold a dialogue with religious groups, that of course, include the CBCP. The dialogue is meant to ease the tensions between the government and the Church. Furthermore, President Duterte is set to meet with Catholic Bishops’ Conference of the Philippines president Romulo Valles on July 9, in an attempt to ease the growing tension between the administration and the Church.